Letizia is a PhD student at UCL. She collaborates with the 100,000 Genomes Project, a national research programme established to sequence the genomes of 100,000 samples from patients with Rare Diseases. Prior to this, she graduated from Sapienza University of Rome with an MSc in Genetics and Molecular Biology and a BSc in Biology. After graduation, she was awarded the Unipharma Graduates grant and did an internship at Babraham Institute (Cambridge) where she improved her bioinformatics and programming skills. 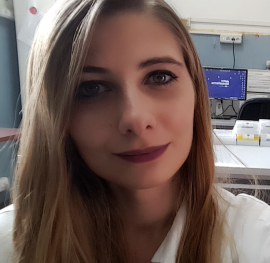 She strongly believes in a synergetic relationship between experimental and computational approaches and her research allows her to combine bioinformatics skills and wet laboratory skills and to pursue the functional analysis of selected novel potential disease-causing variants using facilities and expertise across the partnerships. She attended the Utrecht Summer School on Translational Medicine in 2018. Letizia is member since 2018. Copyright Apollo Society - All rights reserved.